The library catalogue and BookMyne mobile app will be unavailable due to essential maintenance from 07:30am to 08:30am on Tuesday 25th November. We apologise for any inconvenience caused. We regret to advise that we are presently experiencing difficulty viewing video content on RGU PCs from the above website. This has been reported to IT Services who are investigating. Apologies for any inconvenience this causes. This is part of a series of spotlights on resources available from the RGU library service. 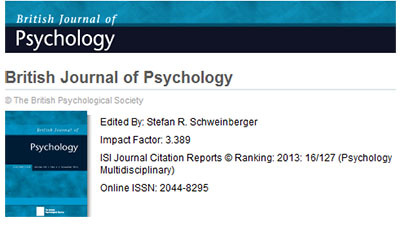 The journal British Journal of Psychology publishes original research on all aspects of general psychology including cognition; health and clinical psychology; developmental, social and occupational psychology. Association of personality with physical, social, and mental activities across the lifespan: Findings from US and French samples. Written by Stephan, Y., et al. Published in 2014 in volume 105, issue 4, pp. 564-580. Stress in telephone helpline nurses is associated with failures of concentration, attention and memory, and with more conservative referral decisions. Written by Allan, J. L., et al. Published in 2014 in volume 105, issue 2, pp. 200–213. We’ll never get past the glass ceiling! Meta-stereotyping, world-views and perceived relative group-worth. Written by Owuamalam, C. and Zagefka, H.. Published in 2013 in volume 104, issue 3, pp. 543–562. RGU library service provides access to this journal online from 1996 to the present day from Wiley and 1975 to the present day (with a one year embargo) from Business Source Complete and in print from 1968 to 2010. To take a look at the online journal you can always get access to it from the library catalogue which includes log in information in the full record section. Alternatively you can follow this link to the Wiley website and see what the British Journal of Psychology journal has to offer*. *To log in please enter your RGU username and password when prompted. Do you want to be a Learning Centre Ambassador? We are hoping to recruit a small team of Student Ambassadors to help with the day-to-day activities in the Learning Centre and support the Learning Centre team in the on-going engagement with students. The Learning Centre Ambassadors will be expected to work a maximum of 4 hours/week, at a rate of £7.75/hour and will be involved in activities including supporting the team with the marketing of the Learning Centre as well as engaging with students in the gathering of feedback and general queries. If you would like to join the team, please email your CV and a short covering letter outlining why you think you would be right for the role to gsslearningcentre@rgu.ac.uk by midnight on Sunday, 23rd November. Find out more about the role here. If you have any questions, please contact Irina Radu on i.radu1@rgu.ac.uk or 01224 263074. Author libraryrguPosted on November 13, 2014 January 29, 2015 Categories Library NewsTags gss learning centreLeave a comment on Do you want to be a Learning Centre Ambassador? If you would like to find out how to search for books, eBooks, and journal articles then sign up for one of the Library research skills classes we are running each week. Each week we are running these classes on different days and times, they last for an hour and will give you the fundamentals of what you need to find resources for your essays and projects! The timetable is available here: library classes and drop in sessions and you can sign up for sessions by just clicking the session you are interested in and filling in a form. But of course sometimes you have a question not covered by these classes, need a quick answer, or would like to speak to someone one to one. Therefore when the classes are not being run IT Lab 337 is open for everyone to use / drop in to and a member of library staff will be available to answer any questions you have about searching for information. We look forward to seeing you there.